Next tour: The Manchester Bee and Other Spectacular City Symbols, Tue 16 Oct 2018 . Meet: Queen Victoria Statue, Piccadilly Gardens, 2.30pm. Ed Glinert is trawling the streets of Manchester locating every last interesting symbol that might reveal the really interesting history of Manchester. We will start with the ubiquitous story: the full story behind the buzz. Why the bee for Manchester? In the aftermath of Manchester’s tragedy the bee is appearing throughout the city as a solidarity symbol and a tattoo choice. The bee – the worker bee – is already evident throughout Manchester on municipal structures. In the Town Hall the platform outside the Great Hall is called The Bees and is decorated appropriately. The city’s coat of arms features a globe coated with bees; worker bees. At Manchester Art Gallery the most famous and admired painting is Work by Ford Madox Brown. So how did the bee first appear in prominence? The Manchester bee is the worker bee for this is a city founded on the notion of work. Manchester was the first city in the world to pioneer a new type of work: mass production. Tens of thousands of workers, striving like bees for the greater good, in this case the creation of the world’s first and greatest industrial city. At the same time the council unveiled its Latin motto: Concilio et Labore – “With diligence and hard work”, a phrase derived from the Biblical apocrypha book of Ecclesiasticus. The bee is also a symbol of wisdom, for it collects nectar from flowers and converts it into honey. Throughout the Old Testament the Israelites are told that God will take them into a land “flowing with milk and honey”. 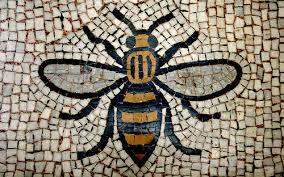 The bee was also an important symbol for the Freemasons who then governed Manchester. In Freemasonry the bee is a symbol of co-operation, that societies can only accomplish difficult tasks when they cooperate. St. John Chrysostom, the 4th century preacher, explained that “the bee is more honoured than other animals, not because it labours, but because it labours for others”. And Manchester in the 19th century became the home of a new political philosophy – co-operation, whose headquarters are still in the city.